Denny's is going in a new direction by tapping into new markets. One of 49 "heritage remodels" completed by Denny's in 2013. Source: Denny's. 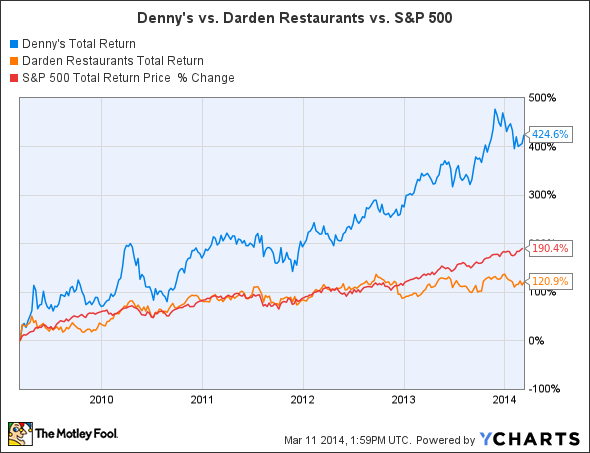 Five years ago, Denny's (NASDAQ:DENN) appeared to be on the brink of extinction. Today, it's as bustling as ever. How has the diner-themed chain accomplished this while competitors like Olive Garden and Red Lobster still have one foot in the grave? The answer is simple, Denny's is aggressively pursuing new markets. Over the last few years, the casual-dining chain has started staking its future on locations that cater to travelers and military personnel more than inebriated 20-somethings -- I know the latter is an oversimplification, but you get the point. Will the strategy work? By the looks of it, the answer is "yes." In recent presentations and press releases, the company explains that it's opening new restaurants in truck stops, airports, universities, and military bases -- OK, perhaps the university eateries will still cater to its stereotypical clientele. Taking advantage of Denny's strong brand awareness, the Company's non-traditional concepts, Denny's Fresh Express and Denny's AllNighter, utilize streamlined menus for locations where convenience and portability are critical. This includes colleges, airports, military installations, hospitals, travel plazas, food courts and other similar locations where Denny's Grand Slam breakfasts are served all day, in addition to satisfying portable menu items for consumers on the go. Take Denny's partnership with Pilot Flying J, the nationwide chain of truck stops. In 2010 and 2011, Denny's began operations in 123 Flying J Travel Centers, accounting for almost all of the diner's unit growth in those two years. At the end of 2013, moreover, Denny's opened its first "nontraditional military base restaurant" at Nellis Air Force Base in Las Vegas, Nevada. "Denny's newest Fresh Express location demonstrates the success we are having delivering the Denny's experience in non-traditional formats," said Greg Powell, vice president of concept innovation. To date, the new direction, as well as a handful of operational adjustments and promotional tactics, appears to be paying off. As you can see in the chart above, Denny's systemwide same-store sales have increased consistently since the second quarter of 2011. While the chain isn't turning in double-digit comparable sales figures like fast-casual upstart Chipotle Mexican Grill, it's easily outpacing casual-dining competitors such as Olive Garden and Red Lobster, both of which are dealing with rapidly deteriorating same-store sales -- click here to read about Olive Garden's recent travails and here for Red Lobster's. The net result is that shares of Denny's have handily outperformed both Darden Restaurants (NYSE:DRI) -- the parent company of Olive Garden and Red Lobster -- and the S&P 500 over the last five years. Since the beginning of 2009, Darden's total return is 121%. The S&P 500's is 190%. And Denny's is 425%. Does this mean you should double down on Denny's stock as you would a Grand Slam breakfast? Not necessarily, as many challenges lie ahead for the casual-dining industry. But it does mean that Denny's shareholders, at least for the time being, are happier today than they were half a decade ago.